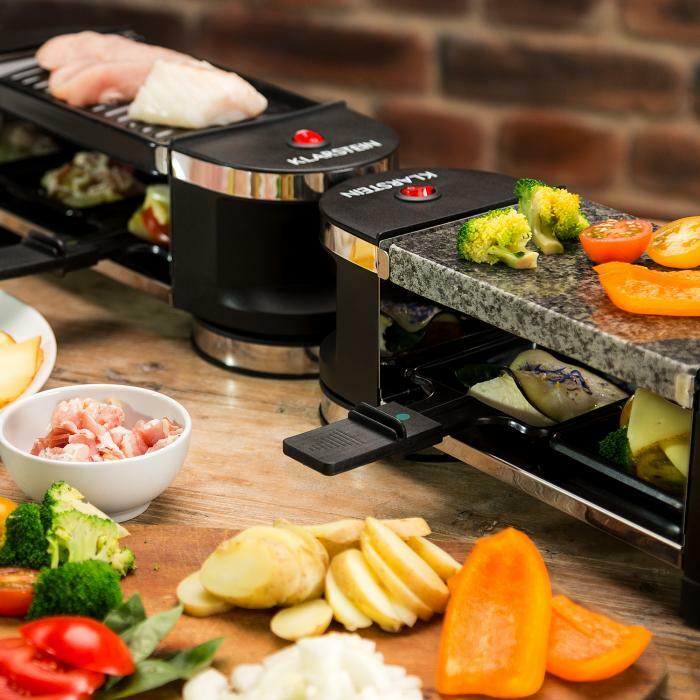 The Raclette-BBQ Tenderloin by Klarstein offers flexible innovation when enjoying the cheese and BBQ party. Up to 8 people can indulge the tenderloin, the tasty lust for roasting, gratinating and melting cheese, while preparing ingredients such as potatoes, fish, meat, vegetables and natural cheese to their own individual preference. 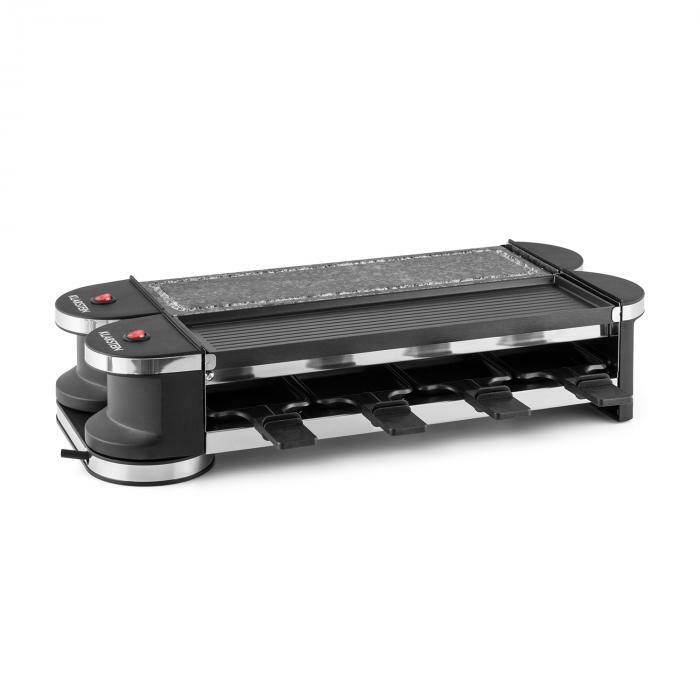 The raclette BBQ is equipped with 8 small pans for gratinating cheese, one metal platform for roasting and another platform made of natural stone for fat-reduced barbecuing. So far so good: the lengthwise divided construction with storage on a 360° device base is the special innovation of the tenderloin. 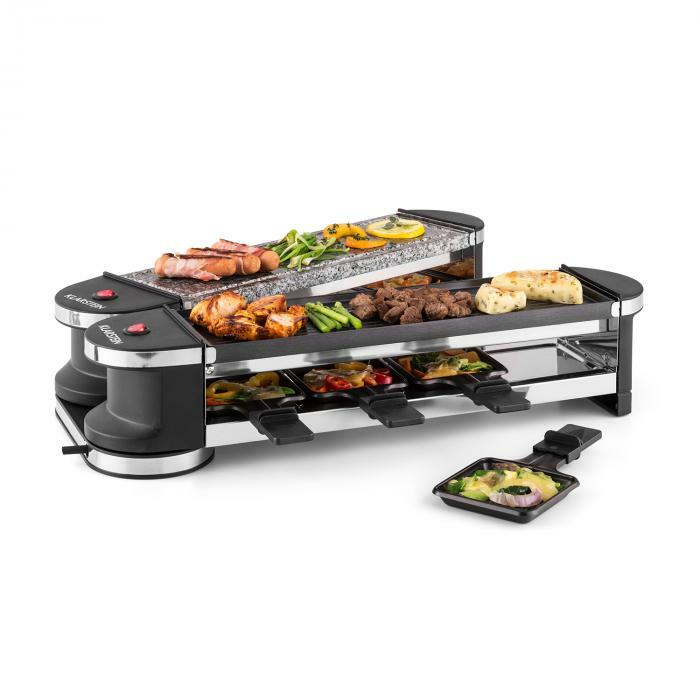 The raclette-BBQ can either be put in the middle of the table as a compact table BBQ or it can be opened up lengthwise for double the size, but half in width. Also the positioning across the corner or in V-shape is possible. In this way the Tenderloin can be perfectly adapted to the table space. Handy feature: both BBQ halves are provided with an On/Off switch, so whenever you are in a smaller group you can even gratinate your raclette on only one half of the device. Also the design of the Tenderloin Raclette BBQ is absolutely convincing. 1200 W power heats up the heating coils. The heated coils get the anti-stick layered trays glowing as well as the natural stone plate and the metal grill platform. The former is made of polished granite and has a milled groove as an outlet for frying fat. The metal platform made of an anti-stick coated aluminium pressure cast with grill grooves give meat a delicious barbecue look. Every little frying pan has a wooden spatula that easily removes melted cheese and food from the BBQ platform without causing scratch marks on the surface.